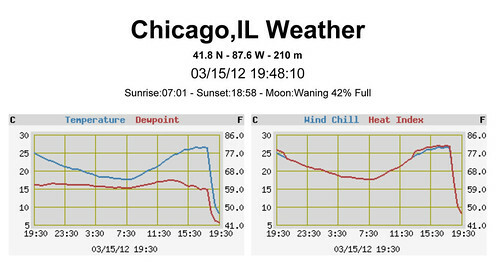 The temperature display from the U of C's weather station provides a dramatic visualization of the "pneumonia front" this evening. The day's gradual curves fell off a cliff around 6:30pm, collapsing from approximately 80 degrees fahrenheit to approximately 47 degrees in less than an hour. A screenshot of the change is after the jump.